Like FREE food, drink, and discussing things like electric scooters, the cafeteria ban, and citywide internet in San Francisco? 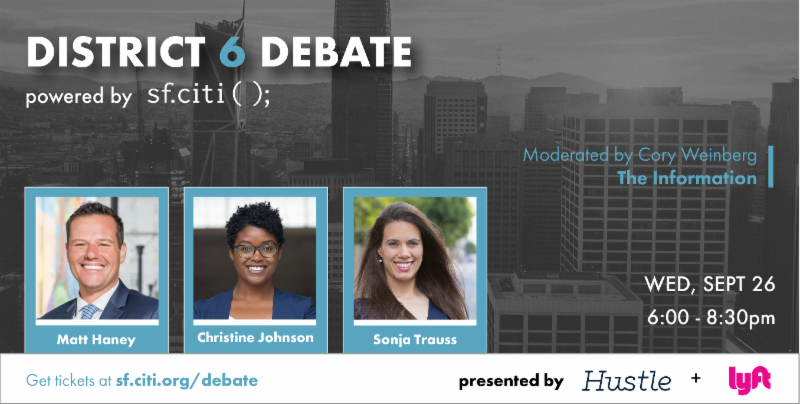 Get tickets to attend a tech-focused District 6 Supervisor Debate on September 26, hosted by sf.citi, Hustle, and Lyft. Come November, San Francisco voters will determine the future of our city. Few races could be more important for the technology community and the city as a whole than the race to lead District 6—home to both San Francisco tech companies and neighborhoods in need. How do candidates Matt Haney, Christine Johnson, and Sonja Trauss plan to tap into District 6’s technology-fueled resources and innovative mindset to solve SF’s most pressing issues? No better way to learn what differentiates the three candidates than by coming to sf.citi’s tech-centric debate, moderated by Cory Weinberg of The Information. sf.citi and WeWork hosted The Future of Food, a one-of-a-kind discussion and sampling of the latest in food tech as an affiliate event of the Global Climate Action Summit. Close to 250 food, tech, and sustainability enthusiasts packed into one of WeWork’s largest San Francisco locations, where they enjoyed so much more than stunning sunset views of the Bay. Early arrivals fueled up on a wide selection of plant-based goodies—some of which haven’t even hit the market—curated by New Crop Capital, as well as JUST and SF local Om Sabor. Guests then filed upstairs to enjoy more delicious eats by Impossible Foods and hear opening remarks by none other than WeWork Co-Founder Miguel McKelvey. In classic sf.citi fashion, our panel featured a unique blend of public and private insight on food innovation and sustainability from Lindsay Baker, WeWork Vice President of Sustainability and Wellbeing, Ryan Bethencourt, Partner at Babel Ventures and CEO of Wild Earth, Katerina Robinson, Legislative Director to California State Senator Nancy Skinner, Josh Tetrick, CEO of JUST, and moderator Erin Brodwin, senior science and technology reporter at Business Insider. Read more about our magical, food-filled evening and look for yourself in our photo highlights! sf.citi continued our Lunch and Learn series at Y Combinator with District 6 Supervisor Candidate Matt Haney and District 10 Supervisor Candidate Shamann Walton. 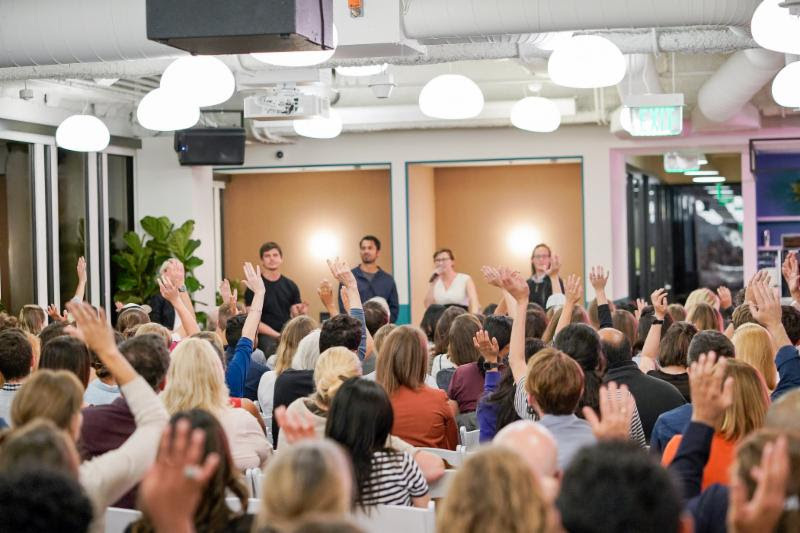 Many sf.citi members, including Affirm, Airbnb, Cloudflare, Cruise, Dropbox, Postmates, Uber, Waymo, and more, packed the room and asked thought-provoking questions of the two candidates. D6 Candidate Matt Haney started off our two-part Lunch and Learn with an optimistic vision of the city’s future and “our ability to solve problems,” all while acknowledging the “tremendous challenges” facing District 6. He underscored the importance of balancing continued growth, especially that fueled by technology, with equity. D10 Candidate Shamann Walton, meanwhile, emphasized what he thinks the tech community can do to be a strong partner to San Francisco. He encouraged more internship and externship programs that help interest the city’s youth in tech and give them tools to be successful in the industry. Question for the candidates: What are your thoughts on measures that go to the ballot via the signature process, especially when made without conversation with affected stakeholders? Want to represent your company in more tech policy discussions like this one? Sign up to be an sf.citi member today! As if we didn’t have enough sf.citi excitement, we finished last week with an exclusive meet and greet between sf.citi members and Mayor Bill de Blasio of New York City. Speaking to representatives from a number of sf.citi member companies, Mayor de Blasio answered questions on what makes smart tech regulation. When working with local policymakers, the NYC Mayor encouraged tech to highlight the opportunities tech can represent while addressing concerns about job security, safety, and sustainability. On September 11, sf.citi helped turn a day of tragedy into a day of doing good. We joined HandsOn Bay Area, the San Francisco-Marin Food Bank, and 9/11 Day in galvanizing San Francisco businesses (including many sf.citi members), policymakers, and more to pack 1.5 million meals for people in need.